Everyone in town has a story. It should be hard to dominate your surroundings from a child-sized table, but Lovie McCathern has it down. As a volunteer with FiftyForward’s FLIP (Friends Learning In Pairs) program, McCathern works with students in South Nashville’s Una Elementary School who are in danger of falling behind in their reading and math skills. But where most FLIP volunteers are on hand for a few hours two days a week, McCathern is a fixture at Una Elementary every day. 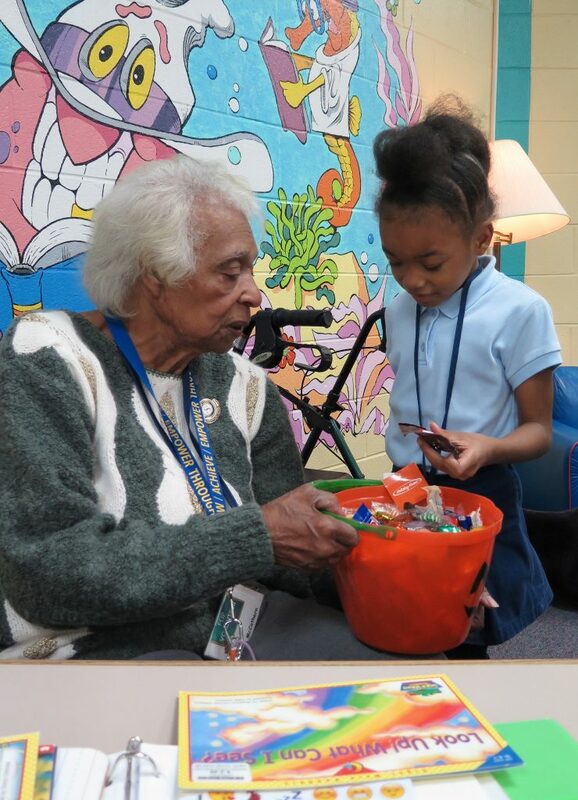 “Nana,” as the students know her, is everywhere. 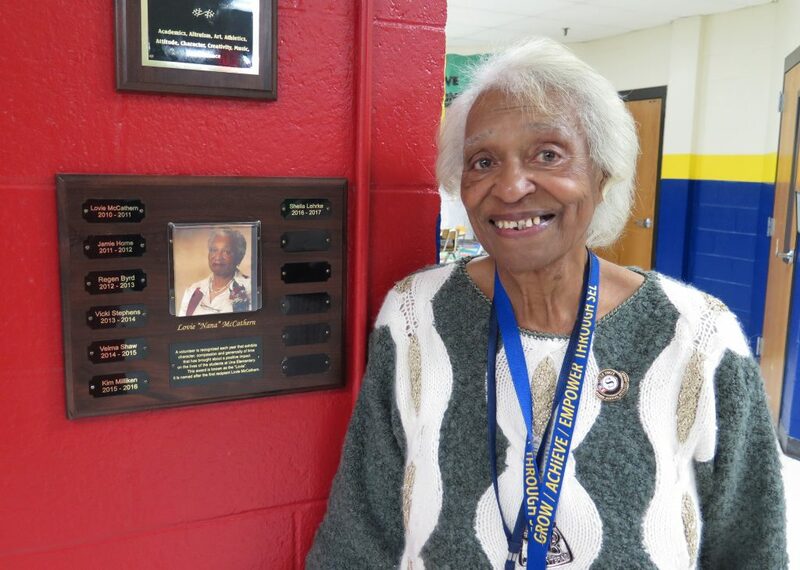 In addition to “her” table in the school’s library, there’s a service award and a book-distribution area named for her and marked with plaques, so her presence is felt even when she’s unseen. 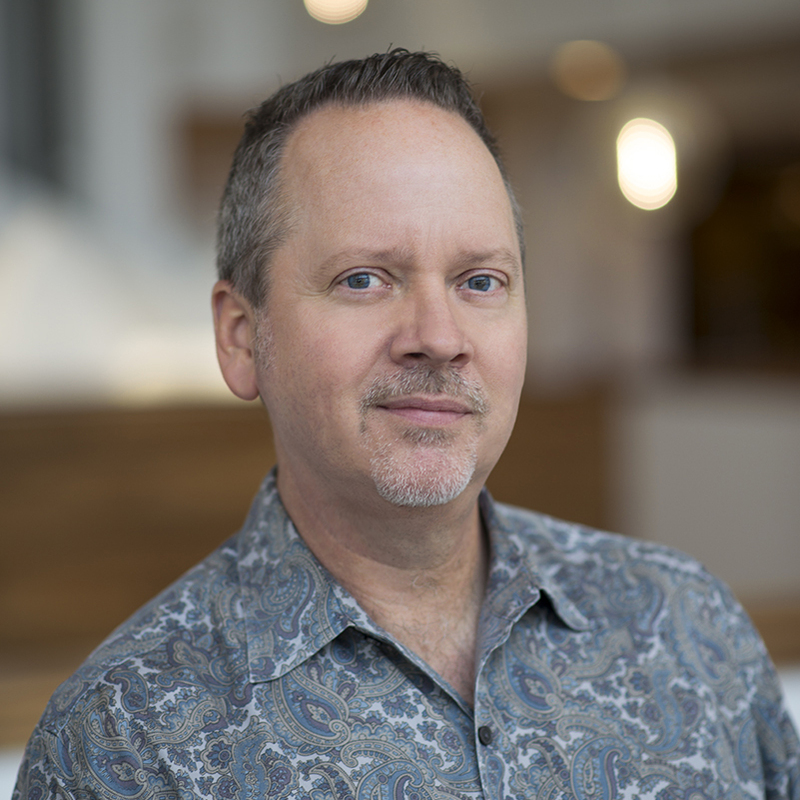 “A few weeks ago, there were some boys out in the hall carrying on, and I heard one of them tell the others, ‘Nana is sitting around there somewhere, and you better slow down,’” McCathern says. Parenting her own three daughters or the children of others comes naturally to McCathern. The soft-spoken Nashville native knows when to take the soft approach, and when to gently but firmly crack down. McCathern began her tutoring career nine years ago, several years after retiring from Vanderbilt University Medical Center, where she was involved in surgical prep work. She worked in mental health for 22 years, and throughout a life working in healthcare, she says she did a “little bit of everything.” Tutoring was something very different, but she’d been working with children in one way or another her whole life, so it made sense. That intuitive approach to honoring children’s wishes and also setting firm boundaries meant that she has been a friend to youngsters throughout her life, so working at a school made sense. Soon, however, she was at Una Elementary far above and beyond the FLIP program’s requirements. Now she’s literally there when the doors open. Her day consists of working with students one-on-one as they are sent to her from different grades. She originally worked with older students, but now she primarily works with kindergarten and first-grade children. She gets a heads-up from the teacher regarding what areas need work, and she selects books or worksheets tailored to that child. The last thing she wants to see is a child who’s not ready feeling the pressure to advance. She’s also not above using her age and position to bend the wills of an errant third-grader or two. “I had a couple of boys cutting up so bad, I told them ‘Look, you are going to get me fired. I won’t have anywhere to live, or food to eat. I’ll be out the street,’” she says, laughing. 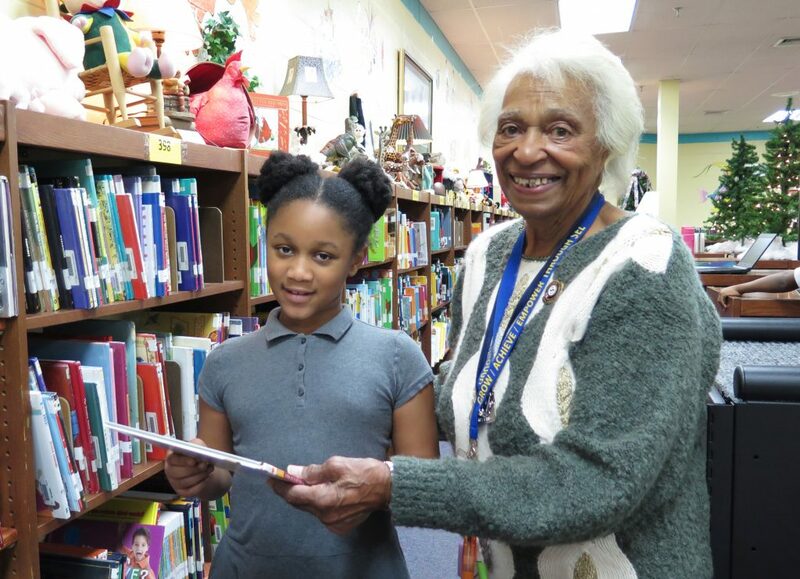 McCathern does a lot more for Una Elementary than serve as its unofficial grandmother. A few years ago, she won a community volunteer award presented by Bank of America. 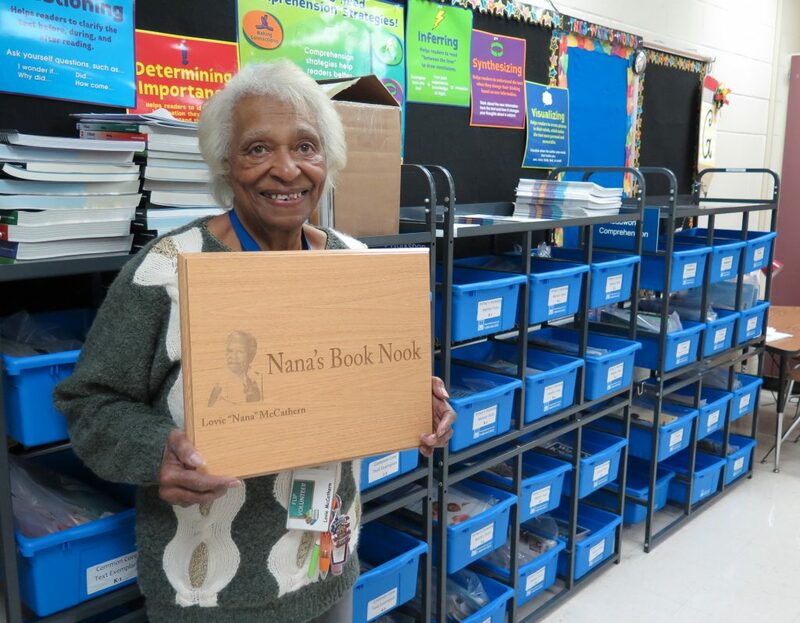 She wasted no time: her $5,000 prize went straight to the school, starting what’s now known as “Nana’s Book Nook,” a supplemental reading resource center for student and teachers. She also routinely buys teaching materials for use at her command center in the library, Green adds, as well as small treats for the children. Her contributions were officially honored a few years back when the faculty created the “Lovie Award,” an annual recognition of a standout volunteer. 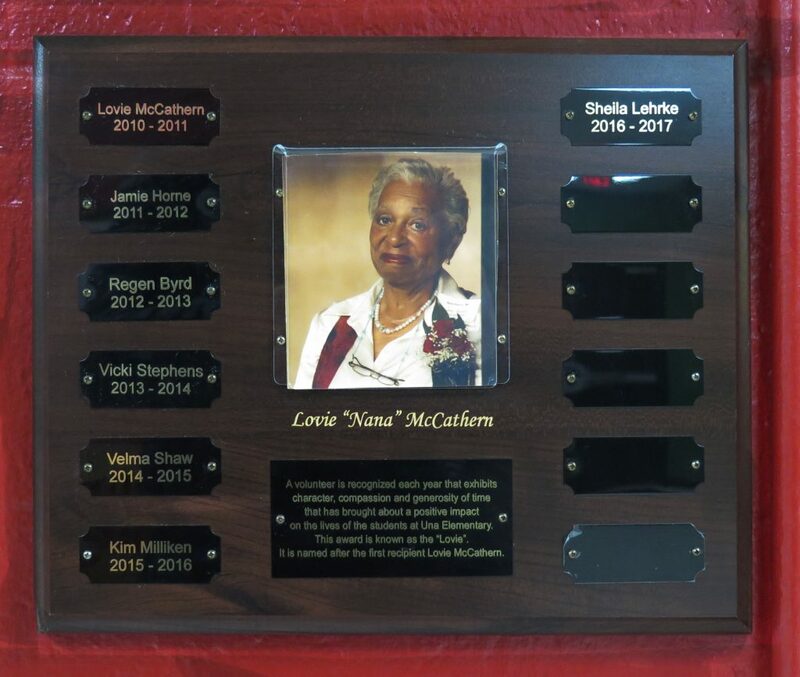 It’s given during the school’s annual friends and family luncheon in the spring, and the winner’s name goes on the front-hall plaque that bears McCathern’s name. ““Lovie reads each nomination herself and beams with pride knowing her legacy of volunteering is helping to inspire others,” Green says. The various honors that come McCathern’s way are all well and good, but like every teacher in the profession, she says it’s the “lightbulb moments” that keep her coming back. She’s also bilingual … a little bit. That eagerness is why the school hopes McCathern keeps coming back for a very, very long time, Green says. McCathern says they don’t have to worry about her leaving any time soon. Whether it’s a dancing day (“I may have my feet going the wrong way, but I get out there with them”) or pajama day or Halloween, McCathern is going to be right in the thick of it. “I’m going to keep coming as long as the good Lord lets me move around,” McCathern says. “I don’t live too far, so as long as I can get out, I’m going to come here. A great joy is visiting Clarksville as often as possible so she can see any or all of her three daughters, six grandchildren and eight great-grandchildren. She loves to terrorize the catfish and crappie population from the banks, having given up on going out in boats. FiftyForward Friends Learning in Pairs (FLIP) began in 1993 and is the signature program of the FiftyForward Retired Senior Volunteer Program (RSVP) and a division of Senior Corps, a program of the Corporation for National and Community Service, the federal agency for volunteering. FiftyForward works to enhance the lives of adults 50 and older in Middle Tennessee, helping people live longer, more fulfilling lives. In the FLIP program, those who interact with the agency for social, recreation or supportive care may also go into elementary schools to serve the future generation. It’s a win/win. There are about 150 volunteer tutors, who go into a school at least once a week to work with four students for 30 minutes each. Many spilt that up into a two-day, two-hour workload. Schools and tutors are carefully matched, Peadro says. “Most schools are aware of our program, and over the years as guidance counselors, principals and teachers have moved between schools, they have taken us with them,” she explains. To learn more about FLIP and volunteer opportunities, click here. Volunteer engagement through intergenerational programs. FiftyForward Supportive Care programs offer assessment, access to services and community resources. Staff assists customers with myriad tasks as well as accompaniment to critical appointments when family or friends are not available. FiftyForward Supportive Care Services include: Adult Day Services; Meals on Wheels; Living at Home Care Management; Care Team; Conservatorship; and Victory Over Crime. Day trips to local and regional events and destinations. 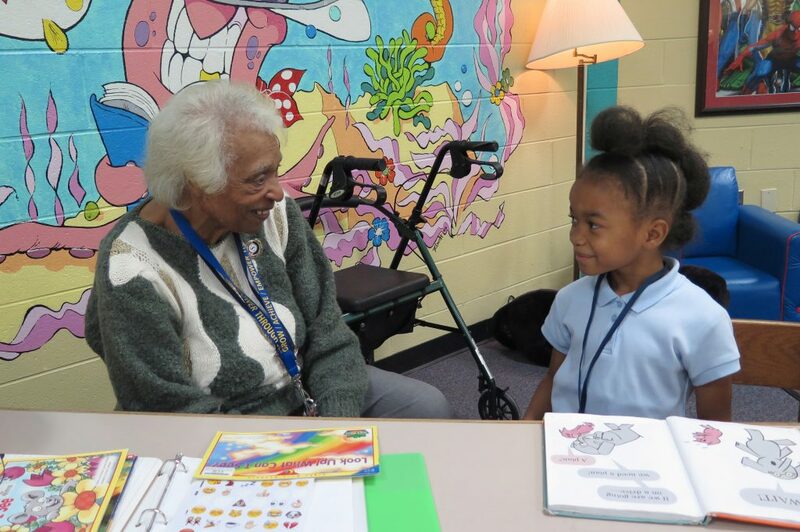 The FiftyForward Office of Volunteer Engagement provides opportunities for older adults to engage and give back to the community, including volunteering, FLIP and the Foster Grandparent Program. For more information on FiftyForward, please visit www.fiftyforward.org or call (615) 743-3400. Sign up for emails to be in-the-know about Unsung Nashville. We’ll only contact you once a month.